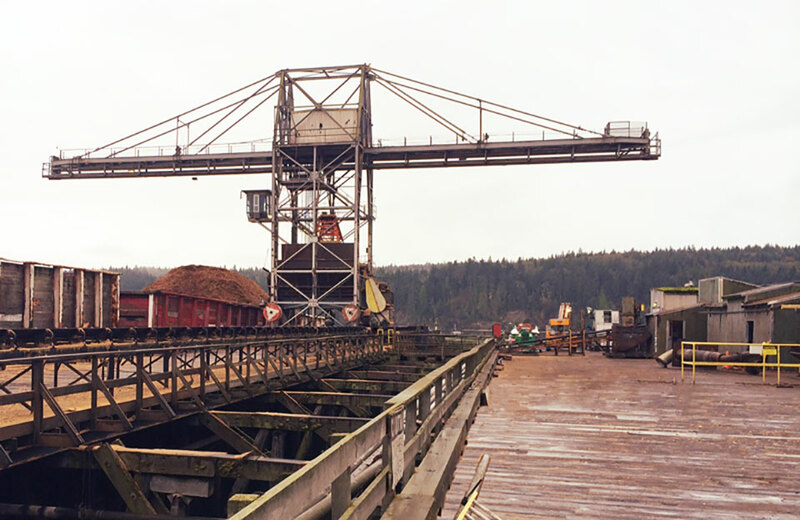 Receiving wood chips and hogfuel by barge is very important to the mill. It is an economical way to transport materials and PTPC receives 120 barge loads each year (equal to 5829 truckloads). Receiving these materials by barge instead of by truck prevents the on-road vehicle emissions and traffic congestion from 5829 trucks driving to and from the mill. However, unloading barges at the mill docks can result in wood chip spills to the water. PTPC is working on improvements to minimize these chip spills to Port Townsend Bay. Barges at the mill are unloaded using a large stationary crane with a clamshell bucket called the PECO crane. Current practices to minimize chip spills to the water include weekly vacuuming of the PECO dock area using a vacuum truck, curtailing barge unloading operations during periods of high winds, and regular visual inspections of unloading operations to look for where chip spills might be occurring. Additional improvements to the barge unloading operations are being evaluated for implementation in 2015. These improvements include tightening the spacing between PECO dock planks, monitoring the particle size of incoming hogfuel, extending the canvas apron under the PECO crane arm, and modifications to the conveyor belts that move chips and hogfuel from the dock to the operating areas of the mill. In summer 2015, PTPC is planning to remove sunken chips from around the mill docks using a dredge. The last time wood chips were dredged from this area was 10 years ago. Wood chips that sink and accumulate on top of marine sediment is bad for marine life. Large quantities of sunken wood changes the properties of the native sediment and as the wood decays it depletes oxygen from the water and sediment. Low levels of oxygen in the sediment negatively impacts the the bottom-dwelling organisms, also called the benthic community. These organisms include bacteria, algae, larva, crustaceans, sea stars, anemones and fish. . Minimizing wood chip spills from unloading the PECO barges in the future will lessen the impacts to marine organisms, and will also mean that dredging around the marine docks can be done less frequently.